Nature Pointe Homes: LAST NEW CONSTRUCTION HOME IN NATURE POINTE. LUXURY WATERFRONT WEST INDIES STYLE HOME WITH BOAT DOCK AND GULF ACCESS...OFFERS FOUR BEDROOMS WITH FOUR FULL AND TWO HALF BATHROOMS...SPACIOUS CONCRETE BLOCK/MASONRY CONSTRUCTION WITH 5268 SQ FT IN TOTAL WITH 4338 SQ FT UNDER AIR INCLUDING FIRST AND SECOND FLOOR LIVING ROOMS......TWO LEVEL FLOOR PLAN WITH HIGH DECORATIVE CEILINGS... SECOND FLOOR SUITES WITH PRIVATE BALCONIES...1ST AND 2ND FLOOR LAUNDRY...FIRST FLOOR LIVING AREA WITH EXPANSIVE WATER VIEWS...SECOND FLOOR LIVING ROOM WITH BALCONY...ELEGANT APPOINTMENTS THROUGHOUT INCLUDING WIDE EUROPEAN WOOD PLANK FLOORING, MARBLE AND TILE, AND THERMADOR APPLIANCE PACKAGE..COVERED LANAI WITH TROPICAL POOL AREA, OUTDOOR KITCHEN AND LIVING AREA...TURNKEY DECORATIVE OPTION AVAILABLE...FINE QUALITY CONSTRUCTION BY PROVIDENT BEACH HOUSES. Nature Pointe Homes: This 4 bedroom + den waterfront home sits nestled along the Gordon River in the heart of Naples, FL. A true hidden gem, Nature Pointe is a high-end boating community with gulf access that is inclusive of just 20 homes surrounded by natural beauty at its finest. Discover perfection from the moment you arrive. Exquisite Travertine marble flooring, high end lighting, plantation shutters and a first floor master bedroom with pocketing sliders that lead to the lanai. The spacious, gourmet kitchen is elegant and features Wolf and Miele appliances. The stunning wrought iron railings make way upstairs to a stately media room with a wet bar and a large junior master suite. The 2nd floor terrace offers extraordinary views of the river and also overlooks the welcoming salt water pool/spa and outdoor kitchen set amidst lush, tropical landscaping. The sundeck is massive and comes complete with a 16,000 lb boat dock and lift. Just a few minutes from area beaches, Gordon River Greenway Park, shopping, dining and entertainment! Call today to schedule your tour and experience paradise on Gordon River. Nature Pointe Homes: NOW PRICED BELOW MARKET - SELLER RELOCATING - BRING OFFERS! This property & neighborhood offer many unique qualities that will make living here an amazing experience. The Homesite: This peninsula lot has water on 2 sides and is roughly twice the size of other lots in the neighborhood. Keep your boat on the lift at the extended dock or launch your paddle board, canoe or kayak on the river located on the east side of the property.The Home: New impact windows and doors, new Hardiplank siding which is a cement product and low maintenance, open concept floor plan with beautiful hardwood floors, new finish on pool deck, 2 A/C systems new in 2013, and a charming gazebo allowing for an additional space to enjoy the stunning setting. The Neighborhood: The name Nature Pointe says it all. Nature preserves, magnificent waterways with great fishing & bird watching. The location provides a relaxing 20 minute boat ride to restaurants, shops and 40 minutes to the Gulf of Mexico. This gated community is a hidden discover Nature Pointe today! Nature Pointe Homes: Rare is the private water view, not looking into a neighbors lanai. This Western exposure home has truly incredible sunsets across the wide river with a preserve view, never to be built upon . This updated home has a 4 bedrooms & 3 on suite baths , 1 half guest bath, as well as a den that could be converted to a bedroom. Updates include high end cabinets that are dove tailed and soft close The sea glass counter top is fresh and coastal. Top line appliances including an induction stove. There are 4 large lanai's and electric roll down screens. Newer hardwood French flooring throughout . The high ceilings and lots of light, via 4 sets of French doors, make this home click all of the box's. Plentiful closet space , gas fireplace and 2 garden tubs. Nature lovers delight, you will love to see the dolphins swimming in your back yard . 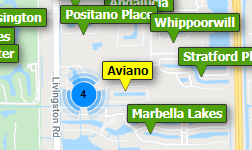 Location is central, near Olde Naples and the beach. Boat to the beach or to the yacht club for dinner . Gordon River lane, located in Nature point, is a private gated road lined with 20 spectacular homes . High elevation of 9ft and block base construction, Vacant easy to see...Great Rental Investment potential as well! Need professional assistance selling your property at Nature Pointe Naples? Find out how an Area Specialist can help to generate more property exposure in order to get the most money for your investment in the least amount of time.